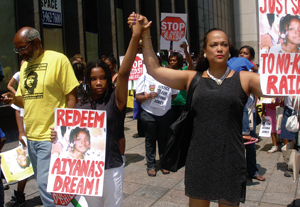 DETROIT (FinalCall.com) - A mother and child from New York City led a march of hundreds from Detroit and across the nation down Woodward Avenue June 26 to condemn the police killing of seven-year-old Aiyana Stanley-Jones on May 16. She and her daughter Honesti, 11, held hands during the march. Detroit police officer Joseph Weekley allegedly shot Aiyana to death during a military-style assault on her home in a poverty-stricken East Side neighborhood May 16. He fired as other officers lobbed an incendiary stun grenade through a front window of the Jones family's home, according to the family's attorney Geoffrey Fieger. Aiyana and her grandmother Vertilla Jones were sleeping on a couch directly below that window. “The First 48,” an Arts and Entertainment (A&E) reality show which features Officer Weekley on its website as a regular star, was filming the episode. The International Aiyana Alliance has also called for a fall march on the U.S. Department of Justice to demand a stop to no-knock raids in the near future. Makeisha Harris, a young Detroit mother who is head of Healing Detroit, led a grassroots march of hundreds throughout the city in May to bring community members together in the wake of Aiyana's death. Ms. Harris participated in the I.A.A. march, as did Joyce Johnson, a leader of the City Airport Renaissance Association (CARA), which is calling attention to the unsolved murders of 12 women in that East Side neighborhood. Myla Johnson of Gary, Ind., who leads the Central District Organizing Project there, brought her six children to the USSF and the march. Bay Area Rapid Transit (BART) officer Johannes Mehserle shot the unarmed Grant, a 22-year-old father, in the back in 2009. Cell phone photos and videos of Mr. Grant's murder which went worldwide, led to three community rebellions in Oakland. Mr. Mehserle's trial is currently ongoing. Wayne County Prosecutor Kym Worthy said in published remarks that the investigation into Aiyana's killing is still “ongoing,” and would not comment on the possibility of charges being brought against Off. Weekley. Detroit youth Arthur Bowman, the grandson of the local leader of the same name, said he and others visited the neighborhood where Aiyana's family lived. The June 26 and national marches were endorsed in the Alliance's founding flier by Allison, Rev. Omar Wilks of Unison Pentecostal Church and Rev. Darryl Young of the Siloam Presbyterian Church in New York, Jaylaco Media, The Native Detroiter magazine, and Salaam Ismial, president of the National United Youth Council & Street Organizing Coalition. Speakers at the rally which concluded the march included Rev. Wilks, Detroit poet Aurora Harris, Ron Scott and Sandra Hines of the DCAPB, Abiyomi Azikiwe of the Michigan Emergency Committee against War and Injustice, and Carl Dix of the New York-based Oct. 22 Coalition Against Police Brutality, Repression and the Criminalization of a Generation.